When you think about things that increase the risk of cancer, you'd probably list things like smoking, UV rays from the sun, or air pollution. But in fact, like the inflation of the nation's waistlines, there's a growing number of cancers that are linked to obesity and being overweight. A new study published in The Lancet this week, from scientists at the London School of Hygiene and Tropical Medicine, has looked at more than 5 million people in the UK, and concluded that around 12,000 cancers every year can be put down to excess weight. Kat Arney spoke to lead researcher Krishnan Bhaskaran to find out more. Kat - When you think about things that increase the risk of cancer, you probably list things like smoking, UV rays from the sun or air pollution. But in fact, like the inflation of the nation's waistlines, there's a growing number of cancers that are linked to obesity and being overweight. A new study published in The Lancet this week from scientists at London School of Hygiene and Tropical Medicine has looked at more than 5 million people in the UK and concluded that around 12,000 cancers every year can be put down to excess weight. I spoke to lead researcher Krishnan Bhaskaran to find out more. Krishnan - So, this was a very large study. We were able to include data from over 5 million people. The way that we did that was to access anonymised GP records from across the country. What we did was we put together the height and weight measurements that have just been made in regular GP consultations as part of routine care. We also looked forward in those anonymised records to see later on whether there are any diagnoses of cancer in the same people. Kat - What sort of timescale are we talking from those measurements being made to then a diagnosis of cancer, 5 years, 10 years, 20 years? Krishnan - Well, it varied, but the data source that we had access to, the earliest kind of records from that were in the late '80s, early '90s. So for some people, we had about 20 years. So, on average, I think we had I think 6 to 7 years of follow up for the average person in the study. Kat - So, it sounds like you're taking this information about height and weight and you can convert that to BMI, and then go, "Well, did they get cancer?" How do you actually go about proving whether there is a link and is it for all types of cancer, some types of cancer? Krishnan - Well so far, that was the simple version. Of course, we have to take into account other the things that might be common causes of having high BMI and later on, getting cancer. So, this is where we do our statistical modelling and tried to use other information we have from the record to discount the effects of other common causes like for example, socio-economic status, smoking habits, drinking. These things could all affect both cancer risk and BMI. So, they could lead to spurious association. So, we tried to collate all the information, on those factors and include them in our modelling so that we really had what we thought was - the real effect of body mass index. Kat - So, what do you find from the data? Krishnan - We confirmed that as we thought there were important relationships between body mass index and cancer risk. And what was quite striking, because this was a broad study and I think the first time, a single dataset where we've looked across so many cancers - we looked at 22 of the commonest cancers. It was striking - the variation in effect actually. So for the major of cancers, there was an association and for 10 cancers, there was a very clear positive correlation. So, the higher people's body mass index was the greater their cancer risk seem to be - and for a few cancers though, it's very little effect. 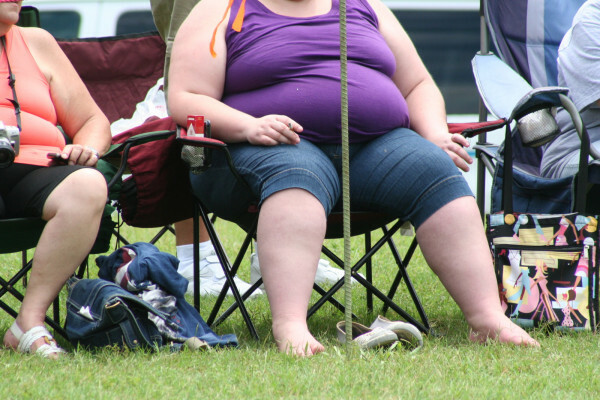 For some, there was even apparently lower rates of cancer among those with the higher body mass index. But I was the minority and those are the slightly more surprising results, but again, they are consistent with what has been shown before. Kat - Which cancers are we talking about here that are most strongly linked to obesity? Krishnan - In terms of what are the impacts on the population, one has to also think about how common these cancers are. So, it's a slightly different answer if you're saying, which of these cancers are worst affected as a population level. But specific cancer type, they already had the most striking positive relationship with body mass index with cancer of the uterus in women. That's womb cancer, which is actually the fourth most common cancer in women. For cancer of the uterus, we found that increasing the body mass index by 5 units which is for an average height woman would be adding about two stones of weight actually increased the risk of uterus cancer by over 60% so really quite a large effect. Breast cancer has a smaller relative effect or association with body mass index. But I think the actual number of cases of breast cancer that we've estimated that would be attributable to excess weight is larger for womb cancer because it's the function of these two things at how largely the effect is and how common the cancer is. Kat - How many cases of cancer are we talking about? Krishnan - That's something we try to estimate in this study. So, by using both the National Cancer Statistics and also the effects that we estimated for body mass index, we estimated for the ten cancers that were really clearly positively associated with body mass index, over 12,000 could be attributable to having excess weight. Kat - Is that every year in the UK? Krishnan - That's every year, yeah. So, that's if you like, if we could somehow magically remove all excess weight from the population, we would expect from these results to prevent about 12,000 cancer cases. So, it's really quite a large population impact. Kat - So, with this study, you kind of feel that this is the strong evidence that we could go out there and say we really know this now. Krishnan - Yes, I think so. I think this really sort of seals out. So, we already knew there were these important effects, but now, we've already put some more meat on it and worked out exactly what the impacts are. And it really just adds ever more to a case of some ambitious policies to deal with obesity in the population which we know are affecting cardiovascular risk, we know they're affecting diabetes risk, and now, we really know the extent to which they're affecting cancer risk as well. Kat - So, adding to the weight of evidence. Kat - Apologies for the bad joke there! While BMI is a useful measure of whether someone is overweight or not, it does have it's limitations as it does not take into individual factors such as bone size, body frame, muscle fat or abdominal fat. It should be used in conjunction with other measurements.